← Success with Matching Engines – what does that look like? I like TICK for its clean and intuitive user interface, but my organisation uses “day” as the time period for budgets whereas TICK reports everything by the hour. So I needed my own app to take TICK report hours and convert them to days. But did you know you can also access this functionality for scripting via the TICK API? 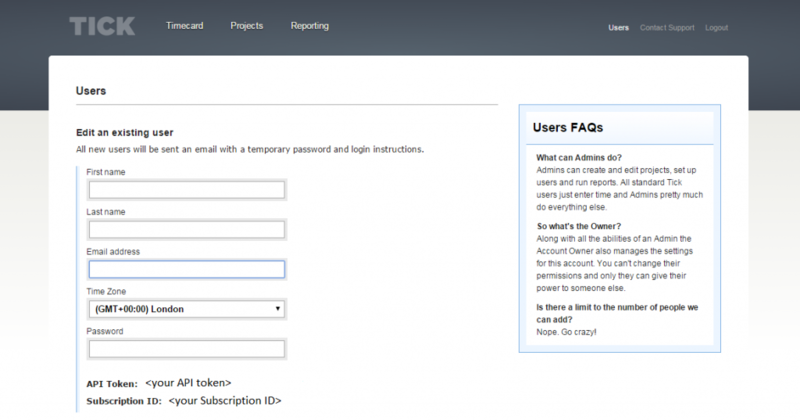 Make a note of your TICK Subscription ID and API Token. These can be found on the Users screen. OK, so now you are ready to build some cURL commands to access all that useful TICK data. First, let’s have a look at the Clients for your Subscription. But what I hear you cry is JSON? JSON format puts the full output in square brackets with each dataset in braces. Elements are separated by colons and strings are in double quotes. So you can see how it can be parsed into rows and columns or array elements. We have already looked at the cURL command for Clients. start_date and end_date gives a restricted range for the Time Entries. You must specify values for them. That’s everything you need to collect all the TICK Time Entry data and feed the rest of your app to construct your own reports. This entry was posted in API, Automation, TICK, Time Recording and tagged automation, cURL, Cygwin, reporting, TICK, Time Entries. Bookmark the permalink. Great article, Ian. Would love to see an example of your reports once you’ve formatted them.